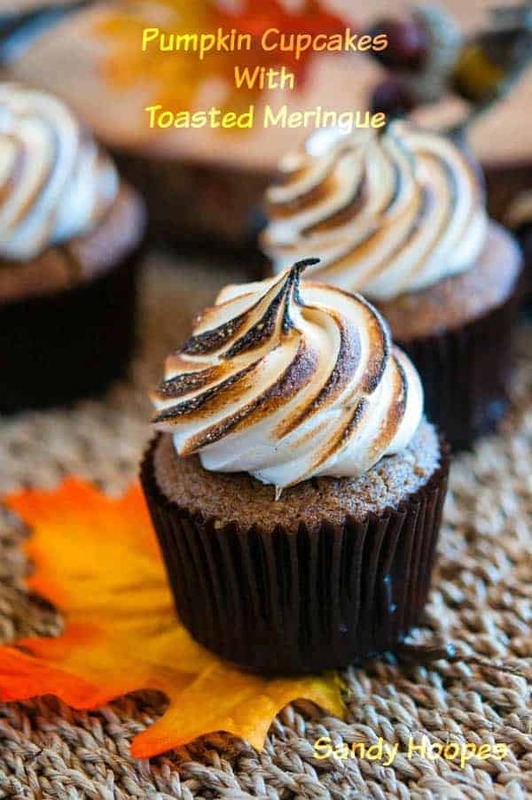 This easy Pumpkin Cupcake Recipe with Toasted Meringue adds healthy pumpkin puree to a boxed cake mix and will be ready in minutes. You can also visit our creative cupcake ideas page for more recipes. Hi, I’m Sandy You will usually find me on my own blog, Everyday Southwest, where I share everyday recipes for today’s busy families. I’m so happy that Candi invited me to be a guest here on A Day in Candiland to share my fast and easy way to put a little “healthy” into this pumpkin cupcake recipe. I don’t know about you but, every fall I make these great big plans to bake amazing treats in all sorts of elaborate holiday shapes—pumpkins, turkeys, ghosts—and every fall I wind up rushing to get something made at the last minute. I guess I have become known as the “Queen of Last Minute Recipes.” That’s ok by me, it is a crown I am proud to wear. I have found that it is really not necessary to spend the whole day in the kitchen to bake something my family really loves so, I try to find ways to pack great flavor into faster and easier recipes. This little pumpkin cupcake recipe is a favorite around my house. For some reason, I neglected to tell everyone that they are actually pretty healthy. Using a 15 ounce can of plain pumpkin puree (not pumpkin pie filling) in the mix sneaks an extra bit of vegetable down my kids without them even realizing it. All they know is that they love the fall flavors and tasty icing. 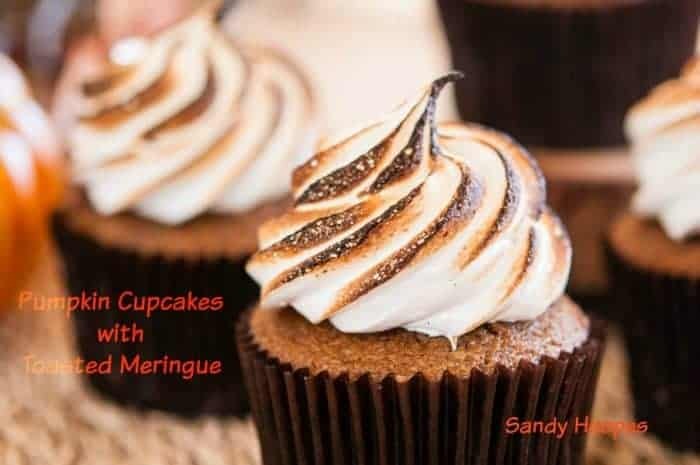 The meringue icing that I use on this pumpkin cupcake recipe is actually a lot lower in fat and calories than the usual buttercream or cream cheese icing. Toasting the meringue adds a marshmallow-y, s’mores sort of taste. The piping bag is not necessary. You can just spoon on the meringue with a spoon or make your own piping bag by filling a large zip-top bag with meringue and then cutting a small piece of one of the corners off of the bag. Be sure to start by cutting a very small corner off, you can always cut more of the bag away, but you can’t make the hole smaller if you cut away too much. 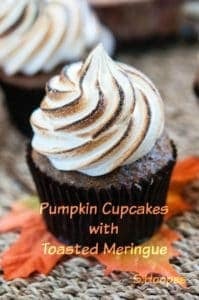 Candi also has more great pumpkin recipes here on A Day in Candiland that will be a great addition to this pumpkin cupcake recipe. Try out her Dairy Free Butter Cream Frosting if you are not a meringue fan. 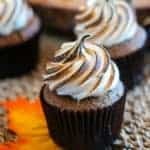 You can always put the meringue icing on her Gluten Free, Dairy Free Chocolate Cupcakes Cupcakes if you are not a pumpkin fan but want to get that toasted marshmallow flavor. Be sure to let Candi know how you like the recipe. You can leave a comment here on this post or follow her on her Facebook Fan Page and leave a comment there. Preheat oven to 350 degrees and prepare a muffin tin with cooking spray. In a large bowl, whisk the dry cake mix and the pie spice together until well blended. Add the pumpkin puree and the yogurt. Mix on low speed until blended then, turn up the speed of the mixer to med-high speed and beat for 2 more minutes. Spoon the batter into the cupcake pan and bake for 20 to 25 minutes or until done and a tooth pick inserted into the center of the cupcake comes out clean. Remove from the oven and cool slightly before turning the cupcake out onto a board or counter. I a large bowl, combine the egg whites, the sugar and the salt. Put the bowl over the top of a sauce pan with simmering water and whisk until the sugar has dissolved. Make sure water from the steam does not get into the egg whites. Remove the bowl from the heat and continue to beat the eggs whites with a mixer on med-high speed. Put the meringue in a pastry bag that has been fitted with a very large star tip. When the cupcakes are cool, pipe the meringue onto each cupcake. Brown the meringue with a creme brûlée torch or place the cupcakes under a 400 degree oven until the meringue is toasted. Wow – those are gorgeous! For some reason, I've never thought of doing meringue on top of cupcakes – it's genius! Yum! These look incredible, I love meringue!! Adding these to the recipe pile! I like how the meringue came out too, I am getting hungry. How DID you get such a pretty toasted marshmallow frosting!? So pretty! Thanks for stopping by Foodie Fridays! Using a torch does the trick. It looks really nice doesn't it. Yum! Stopping by from Foodie Fridays. These sound and look delicious! Think they'd make the perfect addition to the Thanksgiving table. Side note….I'm assuming under the meringue it's 1/2 cup sugar not salt… Thanks for sharing. Pinning! Oh my, that meringue! Pinning because this looks and sounds amazing. Oh, this looks wonderful!! The picture is making me hungry!! Thanks for sharing it with us at Foodie Fridays…pinning now! Wow these cupcakes look amazing! !